Baladev Jew Temple is situated in Ichhapur, Kendrapara, Odisha. 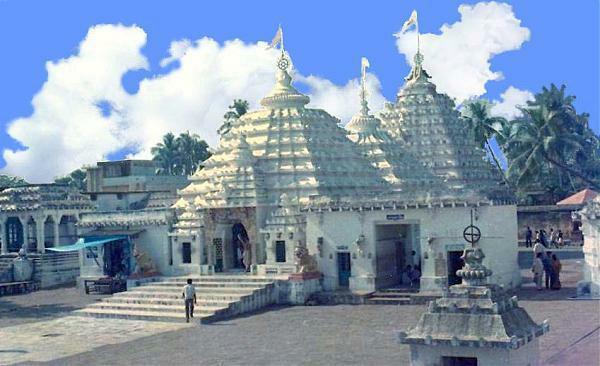 Baladevjew Temple is a very famous temple of Odisha and Balarama is its main divinity. However, Jagannath and Subhadra are also worshipped in the Ratna Sinhasan in the main temple. It takes 3 minutes to travel from Kendrapara to Baladevjew Mandir. Approximate driving distance between Kendrapara and Baladevjew Mandir is 3 kms or 1.9 miles or 1.6 nautical miles . Travel time refers to the time taken if the distance is covered by a car. Rajkanika is surrounded by rivers in three sides, the rivers are Brahmani, Baitarani, and Kharashrota. It is the north end block of Kendrapara district and nearer to Bhadrak and Jajpur District. Its northern end starts from village Gualigan and ends at Bharigada village in the south and starts from Jayanagar in the east to Gopalpur in the west. Rajkanika is well connected from the state capital Bhubaneswar and the silvercity Cuttack by road. More than thirty buses are available from Cuttack to Rajkanika via different routes, private taxis and cabs are available from Cuttack which is a three hours drive from Cuttack. The nearest Railway stations are Bhadrak (55 km), Cuttack (98 km), Dhamara (60 km) and the nearest airport is Bhubaneswar (120 km), intra state water route is also present. The main road for transportation is SH-9A. Bhitarkanika National Park is a national park located in Kendrapara district of Odisha in eastern India. It spreads over 672 km2(259 sq mi) and is surrounded by the Bhitarkanika Wildlife Sanctuary. It takes 1 hours, 16 minutes to travel from Kendrapara to Bhitarkanika. Approximate driving distance between Kendrapara and Bhitarkanika is 64 kms or 39.8 miles or 34.6 nautical miles . Travel time refers to the time taken if the distance is covered by a car.